Hile’s was founded in 1971 by Mary Ann Hile and her sons Charles and Grant. A few years later her daughter Ann joined the company. Charles discussed the idea of starting a stage curtain business with his mother and brother when his service in the U. S. Navy ended in 1970. Mary Ann had experience working in her father’s stage curtain sewing room in Pennsylvania and Charlie had a basic knowledge of stage rigging from summers working for his grandfather. We explored the possibility of starting a stage curtain business in the Tampa Bay area and since there were no local companies in the industry at that time, we decided to give it a try. Our only capital was a used sewing machine purchased by Charles’ father Clarence for $350.00. 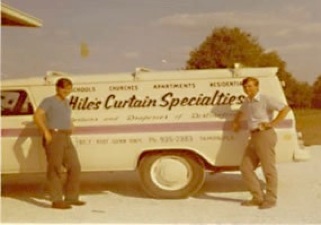 The patio of our home was converted into a sewing room and Hile’s Curtain Specialties was born. Because not many people had stage curtains, we expanded into the residential drapery market, where we fabricated and installed custom draperies and other window treatments. As our business grew we expanded and relocated several times to larger facilities. Today Hile’s has a new office/warehouse/sewing room in a 9,500 square foot facility located in Odessa, Florida. There we fabricate stage curtains, hospital cubicle curtains and window coverings. Additionally, we supply and install pipe grids for CCTV, as well as manual and motorized stage hardware, window coverings, and projection screens. We are still a family owned and operated business with Charles, his daughter Cindy and sons Clayton, Carson, and Clifton, along with other employees who we consider family. We are proud that our company has expanded from servicing the Tampa Bay area to covering the state of Florida, as well as parts of Alabama and Georgia. We’ve enjoyed working together as a family for over 40 years and are looking forward to continuing in this tradition for generations to come.